The most important ingredients in preparing Bu Pad Pong Kari (above). Also use as a colorant for fried rice, or anytime a recipe calls for curry powder. We love it in Gaeng Hanglay, and Thai pork satay. Uniquely Thai, it has a wonderful aroma. 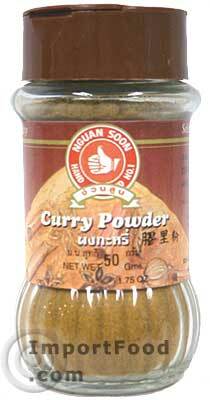 See a selection of our authentic Thai recipes below, using this curry powder. For something unique try it in Thai-style sundried beef jerky. Ingredients: turmeric, coriander seeds, fenugreek seeds, salt, cinnamon, pepper, chili, cumin, galangal. Product of Thailand.